Starting today, we’re reinstating the Back To Basics series. Each Wednesday, we’ll share a Google Analytics tip, usually something that you can try right away with your own data to gain new insights. This week, we’ll illustrate a quick way to see how many visits you get from different keyword/landing page combinations. A friend of mine recently created several new landing pages that she hoped would attract traffic. She wanted to see at a glance whether people who searched on her top keywords were seeing the new pages. While she knew that she could use the Top Landing Pages report to analyze each individual landing page, she wanted to see keyword/landing page combinations in a single report. There’s an easy way to do this. Go to the Keywords report under Traffic Sources. Look over to the right above the table and you’ll see Views: followed by a set of buttons. Click the Pivot view (5th button from the left). Now, look to the left, above the table, and you’ll see a Pivot by dropdown menu. Select Landing Page from this menu. Voilà! The keywords will be listed down the side and landing pages will be listed across the top. 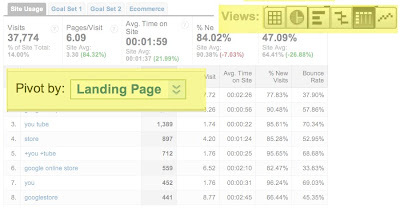 You can now see how many visits you received for each keyword/landing page combination. You can see up to five landing pages listed across the top of the report. You can scroll horizontally (across the landing pages) using the arrow buttons at the top right of the table. The pivot view is also really useful for seeing at a glance how many visits you get from each keyword and search engine combination. To do this, you’d use the same Keywords report and pivot by Source. That’s this week’s tip. We’ll be back next Wednesday for another Back to Basics post.